As a Democrat running for re-election in a state Donald Trump won by 20 percentage points, Jon Tester should have been among the most vulnerable incumbents in the upper chamber this year, but Republican recruitment troubles, a lackluster primary, and the state's recent history of ticket splitting allowed the U.S. Senate race in Montana to float below the national radar. That all changed last week when the two-term lawmaker made himself a highly visible blip on the president's screen. After Tester detailed allegations against Adm. Ronny Jackson that prompted his eventual withdrawal as Trump's nominee to head the Department of Veterans Affairs, the president lashed out at the accuser on multiple high-profile occasions, casting a bright light on the contest. Republicans have the burden and uncertainty of a crowded primary, and they won't know who will take on Tester until votes are cast on June 5. But GOP operatives in the state hope the president's active disparagement of the incumbent through a twitterstorm, a television interview, a press conference with a foreign head of state, and a campaign rally in the Midwest will undercut Tester's calling card as a Democrat who can work with Trump. "This is one of those things where you have such a large megaphone with the White House and the president, and I don't think the president is going to stop," said one Montana Republican. "For the president, this is a personal mission. He's extremely pissed." Indeed, Trump's irritation over Jackson's withdrawal -- which raised bipartisan questions about the administration's vetting process -- is palpable. He has gone so far as to call on Tester to resign and claimed to "know things about Tester that I could say, too, and if I said them, he would never be elected again." Over the past few days, Trump provided enough commentary on the red-state Democrat to be used in Republican campaign ads for the rest of the cycle. But the president's attention span is short and the news cycle moves and morphs quickly. By Monday night, for example, focus had shifted to a report that White House Chief of Staff John Kelly has called the president an "idiot." 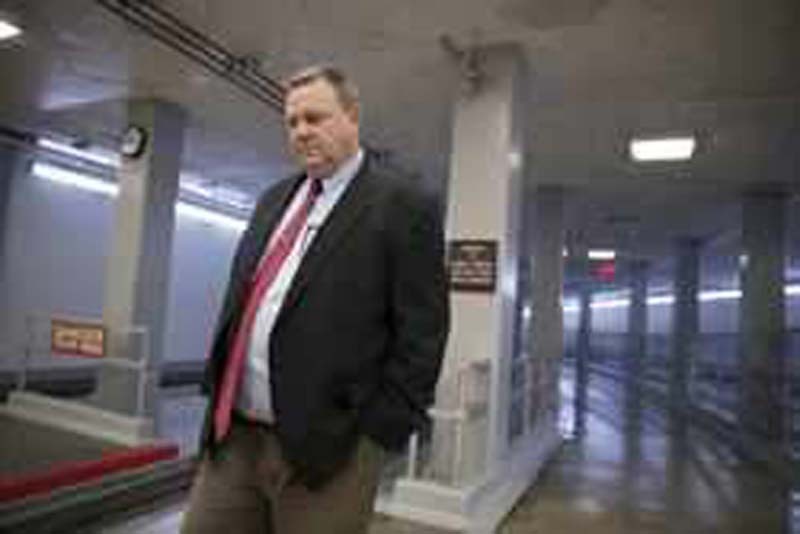 Additionally, Montana Democrats argue that the Jackson vetting saga shows Tester was simply doing his job for his military-heavy state and working to prevent what lawmakers in both parties viewed as an inexperienced nominee to lead the all-important VA.
"The challenge for Republicans is they are putting a spotlight on something Montana veterans support Senator Tester doing and shining a spotlight on an action the Republican chairman of the [Veterans Affairs] Committee agrees with," said a Democratic operative following the race. Chairman Johnny Isakson declined to join Trump in attacking Tester, the panel's vice chairman. "Every senator has the right to exercise their options," he said, according to CNN. Isakson also noted that he and Tester wrote a letter to the White House inquiring about the charges against Jackson, and "we never got that response back, and that's why we didn't have the hearing." Last week, Tester brought forth allegations from over 20 current and former military personnel who claimed Jackson, who has been the White House physician during the Obama and Trump administrations, freely doled out prescriptions, created a hostile work environment, drank on the job and crashed a government vehicle. Jackson denied the charges, but withdrew his nomination last Thursday, saying he did not wish to be a distraction for the administration. The Secret Service was unable to corroborate the allegations. In a statement, Tester said, "It's my duty to make sure Montana veterans get what they need and have earned, and I'll never stop fighting for them as their Senator." Trump has portrayed the situation as rife with politics, and placed the blame, at least publicly, on the state's senior senator. Republicans running against Tester are following Trump's lead, and took issue with his handling of the vetting process during a primary debate last week. "Jon Tester very conveniently brought information up against a man who was getting ready to be considered for secretary of the VA when that information seems like it was available for quite some time," said state auditor Matt Rosendale, seen as the frontrunner in the primary. "We have our own senator from Montana who bullied a fine man to the point he decided to pull himself out of the confirmation process. ... This was wrong," said former state Rep. Albert Olszewski. Billings Judge Russ Fagg said Tester "pre-judged" Jackson, and businessman Troy Downing argued the incumbent went public with "unsubstantiated claims." Republicans acknowledge that the Senate race could take multiple turns between now and November, but they see the president's attacks as way to contrast Tester's votes with Trump's agenda. "He is in a state Trump won by 20 points and he has now caught the ire of the president," said one Montana Republican strategist. "I think this allows folks to pile on a little bit to show where he has been breaking with Trump. [Tester] put a spotlight on himself in the wrong way." Unlike some of his other red-state Democratic colleagues, Tester has voted with the president the least, according to analysis by the website 538. He voted against secretary of state nominee Mike Pompeo last week, for example. He also voted against a temporary funding measure to reopen the government, arguing that Washington could not afford to continue operating on short-term budgets. Republicans argue that record shows Tester to be out of touch with voters, but Democrats say it reflects an independent streak necessary to win in the state. While Trump won Montana overwhelmingly in 2016, Democratic Gov. Steve Bullock was re-elected that year. Tester won his race by four points in 2012 while then-President Obama lost it by 13. In his first television ad of the cycle, Tester touted 13 bills he authored that have been signed by the president. In it, he holds up his left hand, which is missing three fingers from a childhood machine accident. "I'm out of fingers," he says in the spot, "but I'm not finished getting things done for Montana." It's the kind of message that shows why Tester is a difficult opponent for Republicans even in a state that looks favorable for the party on paper. Of the 13 bills, eight of them deal with accountability at the VA and improving health care and benefits for veterans, successes Trump himself has touted. The campaign has also pointed to stories over the past few days of veterans supporting Tester's stance on Jackson. But that's also why Republicans in the state believe Trump's open criticisms of the lawmaker over the episode have the potential to help flip the Senate seat. "This has the potential for this to be one of those crystalizing moments," said the Montana Republican operative. "It's going to put a question mark and open conversation and create a lot of doubt on an area that there wasn't one."